By Lawyers is Australia’s leading library of practical legal guides; written by lawyers, for lawyers. Every piece of content is authored and reviewed by a lawyer or barrister practicing in the state or federal jurisdiction where the legislation applies. With over 15 000 forms and precedents and 130 end-to-end matter guides, we offer practical and professional guidance for all major areas of law. A team of over 30 legal professionals update content to reflect legislative changes, so you can be confident that you’re working with the latest forms, precedents and matter commentary. By Lawyers is designed to help you find precise answers, quickly. Matter commentary explains how to conduct each step of the matter, so you have the freedom to access as much (or little) guidance as you need. Check how to execute one part of a matter, or find end-to-end advice for a matter type you haven’t handled. Whatever your area of specialisation, there are By Lawyers precedents and guides that can help you work faster and smarter. 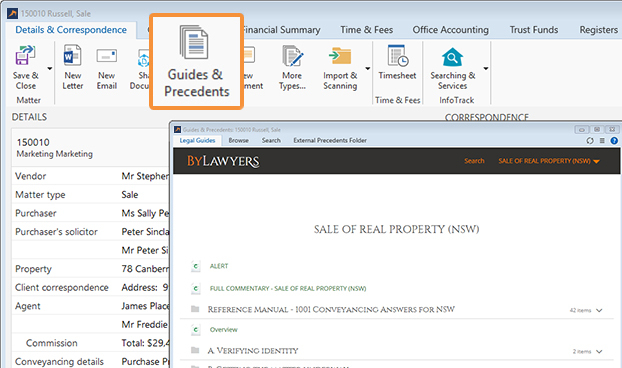 By Lawyers is fully integrated with LEAP, The precedents within the By Lawyers guides in LEAP are automated based on the data in your LEAP matters. Our legal content team will be in touch with you shortly!